UNTYPICAL CONOPHYTUMS IN NEED OF A NAME? Species in the genus Conophyum have distribution patterns that have parallels in many other plant genera. Some species are widespread while others can be confined to just one small locality. Populations of the widespread species tend to be on hills that are separated by unsuitable habitat, particularly sandy plains. They cannot or rarely interbreed because of the distances involved and evolve in their own distinct manner. When assessing a newly-discovered population, it is usually possible to assign it to a particular taxon. But occasionally the differences are such that you are left wondering what name should be applied. The conos discussed here, fall into that category. Typical C. ectypum ssp. sulcatum is only known from a quartz hill called Animub and the quartz flats just to the north of it. This hill is about 30 km north-north-east of Steinkopf in the extreme north-west of South Africa. I find that it is one of the last taxa to emerge from its summer sheaths and it often flowers while the new heads are still encased in the old leaves. The flowers are mid-violet in colour shading to white at the base of the petals and yellow in the tube. At the time of flowering, individual heads in cultivation are around 6 – 8mm across and develop later in the autumn to show the grooved (a sulcus is a groove) shape that Steven Hammer has described as resembling a pulled molar tooth. It has something of a reputation as being difficult to grow, but I have a clone that is particularly vigorous that I have propagated and distributed for many years. 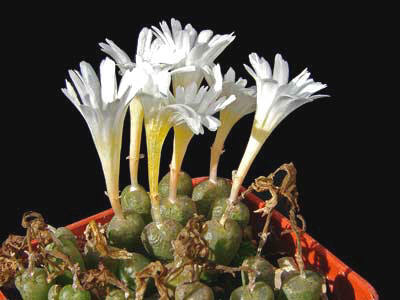 In 2002, Chris Rodgerson sent me a cutting of a white flowered C. ectypum ssp. sulcatum that had been found by a Czech enthusiast called Busek with the locality cited as 10km north of Steinkopf. I assume that this is Josef Busek, who is better known from his work with the Cactaceae. The cutting rooted OK and has grown on to become a 35mm diameter clump of about one hundred individual heads. This differs from typical sulcatum in three features. The heads are only about half the size and are 3 – 4 mm diameter at flowering time, although the two forms share a similar shape and the characteristic of often still being sheathed at flowering time. The flowers are white, albeit with a rosy tint when they first open and with a yellow throat. The third feature is that it appears to be self-fertile and every year produces seed capsules without any intervention from me. My typical form of sulcatum has never produced any seed capsules without hand pollination. I have sown seed from the Busek plant and the resulting plants are all miniature. With three differences from normal sulcatum and an apparent disjunct distribution, the Busek material is possibly deserving of recognition as a distinct subspecies of C. ectypum. However there is a problem in that the locality given for it may not be accurate. A Czech cono enthusiast that I have consulted has suggested that Mr. Busek may not have kept good records as to where the plant was found. Certainly, other people have searched the veld 10km north of Steinkopf without finding it. In the absence of any good information about the wild population that was sampled, it would be foolhardy for anyone to publish a name for the taxon. Another acquisition from Chris was cuttings of a night-flowering cono that he had obtained from Adam Harrower who works at Kirstenbosch and the Compton Herbarium in Cape Town. Adam had collected it from a small place called Tilney at the western edge of the Warmwaterberg under his number ADH 500. This locality is about 25km north-west of Barrydale in the Little Karoo. The conophytums that one might expect to find in this general area are all from the section Conophytum: C. truncatum ssp. viridicatum, piluliforme and perhaps minimum (although normally a bit further north towards Matjiesfontein). The flowers on ADH 500 are creamish-white in colour and not the pink – maroon that one would expect from piluliforme. The heads are also larger than those of piluliforme, so that name can be ruled out as an identification. Looking at the accompanying photo (there are 2 clones in the picture), the steel-grey or purple-grey bodies are quite unlike those of viridicatum; I think of viridicatum as being one of the more boring green taxa to the extent that I have never bothered to propagate it. This leaves C. minimum as the only possible species to which ADH 500 might belong. This is a particularly variable species such that many local forms or even single clones were given specific names in the past. Greyish bodies do occur in minimum; just think of some of the nicer clones of its ecotype ‘Wittebergense’. Populations of plants on the outer fringes of their distribution often exhibit distinct traits and therefore it is probably best included within C. minimum as a southern outlier. Continuing with the theme of disjunct populations, the next cono to be discussed is a form of C. stephanii ssp. helmutii from the base of the Koeriesberg (Khurisberg), about 25km north-east of Springbok. This was first found by Anthony Mitchell in the 1980s but he did not see the flowers or bring it into cultivation, so he was not aware which species it was. The population was rediscovered by Philip Desmet around 2005 and I received a few seeds under his number PD 3638 from which the plants shown in the photo were grown. The nearest hitherto-known populations of C. stephanii ssp. helmutii are at Eenriet (15km north-east of Steinkopf) and hence about 40km distant. This constitutes a significant range extension for the species. The plants tend to be rather slow-growing compared to other stephanii forms and my largest examples only have about 15 heads after 7 years. Looking at the photo, one is immediately struck by the purple-brown colour of the bodies. Most stephanii ecotypes are green, perhaps with some purple colouration around the sides, so this makes it rather distinctive. Such colouration can be seen in two other section Barbata taxa: C. pubicalyx and most particularly C. depressum ssp. perdurans; both of which can be found in an arc to the south and east of Koeriesberg. In fact, Steve Hammer has told me that there is a population of perdurans that is just a couple of kilometres from the berg. PD 3638 therefore seems to be an ecotype from the area where helmutii meets perdurans and it is tempting to suggest that it is intermediate between the two species. The flower colour of Eenriet stephanii and perdurans is the same copper-orange so no clues from that feature. The bodies of PD 3638 tend to be wider than tall, but do not have the flatness of perdurans. Most significantly, the hairs (trichomes) on stephanii stand out from the body but they tend to lie over the body in perdurans; PD 3638 has them standing out. I am therefore happy to include this local form within C. stephanii ssp. helmutii but there might be some introgression from perdurans with regards to the body colour. 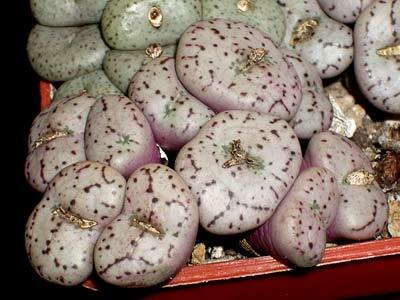 The last plant that I will consider in this article is a local form of Conophytum bilobum. You may well ask why C. bilobum is of interest. It is widespread through the Richtersveld with many colonies and is known to be variable such that many names have been published for distinct forms over the years. These have nearly all been subsumed back into C. bilobum in recent times. About 20km west-south-west of Steinkopf is a fragmented quartzite hill called Rietkloof se berg. This seems to be a hotspot for conophytum evolution as discussed by Gerhard Wagner in the MSG Bulletin [2013, 28(2), page 36). He described a C. ectypum population from the area that is difficult to assign to an existing taxon. Fairly "normal" C. bilobum is known from Rietkloof but in 1995 a population of a small form with short hairs (trichomes) was discovered in the area by Hammer and Marx. This was considered sufficiently distinct from classic bilobum for Steve to name it C. bilobum ssp. claviferens in "The Dumpling". Round about the turn of this century, Etwin Aslander found a small cono in the Rietkloof area that he could not identify and so he sent some material to Steve Hammer under his number EA 272. Steve’s initial thoughts were that it might be a southern extension of a section Saxetana plant, perhaps a relative of the pubescent C. hians. However, when it produced large diurnal yellow flowers, it became evident that it was another local form of C. bilobum. The heads are small for bilobum at 10 – 15mm width and height and it is covered with trichomes in similar manner to claviferens. The photograph shows the distinctive outline of the heads with the lobes and fissure area forming half a hexagon. Surely, if claviferens is worthy of subspecific status then this form is even more worthy. To the best of my knowledge, nobody else has subsequently found this plant in the wild. It is easy to cultivate apart from an annoying habit of sometimes developing white marks on the body, perhaps due to an attack of fungal spores under the old sheaths. 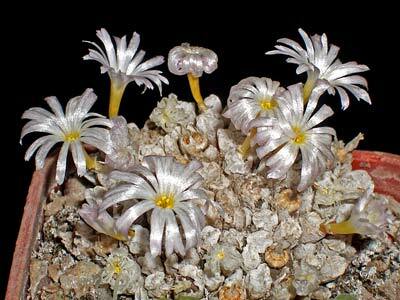 Conophytum roodiae is a widespread species that can be found in grit pans on the gneiss rocks of much of Namaqualand. The body colours are normally shades of green or grey-green and the typical subspecies has smooth bodies. In the extreme south-west of its distribution there is the aberrant form known as ssp. sanguineum and in the south-east of its distribution near the Hoedberg, Jennifer and I found this unusual and attractive form. 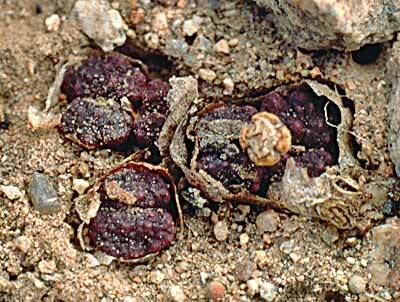 The roughness of the bodies is similar to sanguineum but the brown colouration is different to the red of sanguineum. Looked at in isolation, this population is very different to the norm, but when one searches in that general area it is possible to find transitional forms that are brown in colour but lacking the rugose epidermis. There are also populations that contain brown and green forms mixed together. So although this is an extreme ecotype, it probably does not merit being published as a distinct botanical taxon. From the enthusiasts point of view however, it is a particularly desirable ecotype. 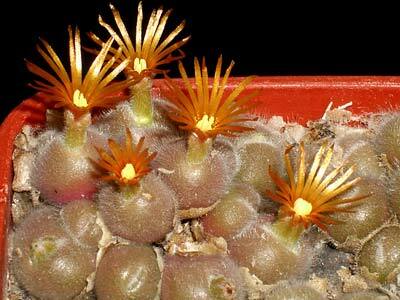 It is not the easiest conophytum to cultivate but fortunately is not as intractable as sanguineum. I have maintained plants in cultivation for around 20 years and also produced seed which enabled me to distribute it to customers one autumn. The seed does not present the difficulties in germination associated with sanguineum. 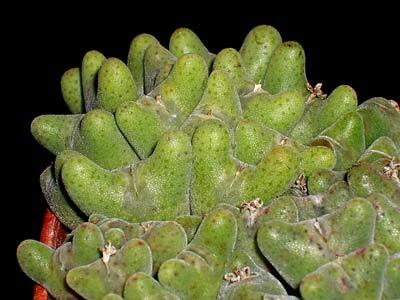 Conophytum pellucidum occupies much the same territory in Namqualand as C. roodiae discussed above. There are possibly a thousand or more populations on the hills and the degree of variation is quite considerable. This has led to the description of various infraspecific taxa such as ssp. cupreatum, ssp. saueri, var terricolor, var neohallii and var. lilianum. However, I do sometimes find it rather difficult to assign plants to some of these taxa. In a valley in the Khamiesberge at a place called Sterkstroom, Gerhard Wagner found this population of C. pellucidum that is very distinct in its body morphology. The heads are very small and cylindrical, about 6mm diameter but almost twice that in eight; an idea of the size can be obtained from the photo which shows a group of plants in a 50mm pot. Furthermore, it is very slow to build up a clump, usually staying solitary for 3 to 4 years and it took over 10 years to build the 8-head cluster in the photo. To me, this is much more distinctive than say ssp. cupreatum and is worthy of subspecific status, but nobody has yet taken the plunge. There are typical ssp. cupreatum populations not very far away but I am not aware of any intermediates. The ecotype is no problem to grow although it is slow from seed. Seed has been available from the MSG and I have distributed plants over the years. What has surprised me is that there have not been many customers for these. Conophytum ratum subsp. gamsbergensis n.n. 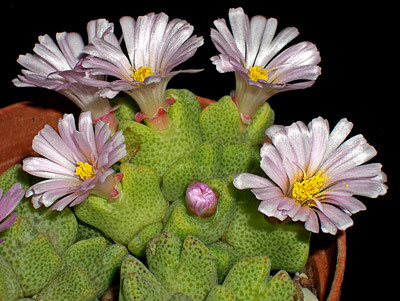 Conophytum ratum is one of the more vulnerable species in the wild. There seem to have been 4 populations known for the typical large form of the species: Onder Namies (type locality), south of Achab se berg, Achab farm and the north-west foot of the Gamsberg. There do not seem to have been many plants at any of these localities, but the type locality was largely robbed out by a collector and the NW Gamsberg population has been destroyed by zinc mining. The plants at these localities grow (grew?) in flat quartz areas with just the top window exposed; they are often with C. maughanii which can look very similar in the wild situation. Wild plants are usually solitary and large, up to 40 - 50mm across. The Gamsberg itself is a flat-topped inselberg with a big crater on the west side. To the north-east there is a plateau region with some endemic species. In this area there is a substantial population of C. ratum which is much smaller than the type, only growing to 10-15mm diameter (even in cultivation). Furthermore it tends to flower in cultivation in mid-August, some 3-4 weeks earlier than the typical form. In my opinion, it constitutes a good subspecies and I wish that I had named it in the early 2000s after I had been shown it. It might have then received some protection from the mining operation. The mine is starting in the crater area but is now scheduled to move to the eastern part and this ecotype is unlikely to survive. The mining company has dug up the large common plants and is preserving them in a nursery for future landscaping when mining has finished, but no attention has been paid to the rare miniatures. 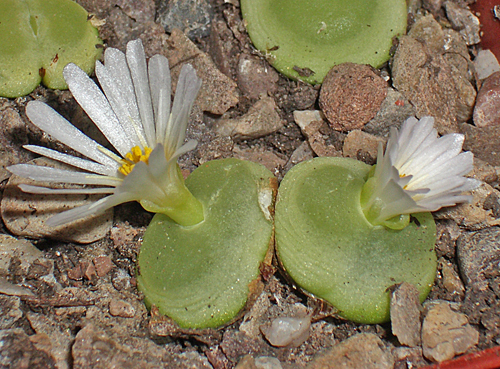 These plants were discovered by Ernst van Jaarsveld under his number EvJ 23727 on the Dabenorisberg which is an isolated steep mountain just south of the Orange River about 100 km NE of Springbok. The top of the keels have slight indentations which is why he considered it to be C. marginatum ssp. littlewoodii when he found it. This also makes biogeographic sense, because littlewoodii is found at a couple of places in the same general area. The bodies on this material grow to about 15mm high and wide in my greenhouse and the colour is a pale yellow green, whereas the bodies are usually a darker green on littlewoodii. The flowers are a surprise because they are more like the ones produced by C. blandum: a much pale pink than littlewoodii; a number of narrow petalloids in the centres of flowers; and produced in mid-October in my collection (much later than normal littlewoodii). Plants of C. blandum are known to grow in a range of hills about 50 - 60km WSW of Dabenorisberg, so there is a reasonable disjunction from that species. A general principle in classification is that form of the flowers is more significant than leaf shape. On this basis, we should regard this as a new subspecies of C. blandum with bodies that resemble some forms of C. marginatum. At the moment it is rare in cultivation but it grows easily and seeds germinate without any problem. Originally published in the "Bulletin of the Mesemb Study Group", but now with additions.